Get lost in The Incredible Maze (Chokkan! Balance * Labyrinth in Japan)! Simply tilt your Wii Remote controller to navigate a series of exciting and twisted mazes. Entering the maze could not be easier, but finding your way out will require a keen eye and a steady hand. Obstacles and traps are around every corner, so move your ball around the maze without falling off the edge. But watch out, there are lots of surprises in store. You can hunt for gems in a timed challenge, or test your abilities in a race against the clock. 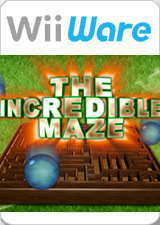 The Incredible Maze is also compatible with the Wii Balance Board, so you can really put your weight into it. This is the way in, but you’ll have to find your own way out. The graph below charts the compatibility with The Incredible Maze since Dolphin's 2.0 release, listing revisions only where a compatibility change occurred. This page was last edited on 18 January 2018, at 00:59.